Criminologist Himura Hideo (Saito Takumi) gets so much pleasure out of being in crime scenes that he's even confessed to having wanted to kill someone. Constantly seeking out the ultimate crime, he is indeed a man with quite a few issues. Mystery writer Arisugawa Arisu (Kubota Masataka), on the other hand, keeps a close eye on Himura's investigations and writes about them, but at times completely misses the point. Not at all the type of guy you'd call dependable, Arisugawa nonetheless professes to be the protector of the clumsy Himura. Although these two men appear like they have no business being in crime scenes, they mitigate each other's shortcomings and use their compelling logic to unravel the elaborately woven tricks left behind by the criminals. It's almost as if Himura and Arisugawa use incredible magical powers to tease out unimaginable truths! Yes, a quite interesting plot, that made me hooked to the drama from the beginning. Every week I looked forward to an episode with a new mysterious case to solve. As a mystery/thriller fan myself, I wouldn’t say that this drama is the ultimate drama of that genre, sometimes I wondered if it was on purpose they drifted from the genre, or they just failed to get it right. In any case, I liked that there was a bit slice of life in it, and especially the bromance (I’m a sucker for bromance in any way). They're great actors in my opinion. The reason why I continued watching was because of the acting. The interaction between the two leads are really enjoyable. This was a good drama, but what made this so watchable was the acting. It’s been a while since I watched a real Japanese crime drama, so I was excited to watch this. I didn’t really know of the story before watching this, which makes it even more thrilling to watch, but unfortunately I recognized the story it is based on very quickly: Sherlock Holmes. To be fair they did change a lot and didn’t add the modern version stories of the 19 century classics which is kind of fresh, and they didn’t try to hide the fact that they were basing it off the classic, but still they should have stayed like that, instead of ending it like the original. Then again, this might only bug me since I am a fan of the Sir Arthur Conan Doyle book series. The actors playing Hideo and Alice are the perfect actors for the roles, and I do understand why they were cast for these roles to play – even if the ‘hair-in-the-eyes’-look made me annoyed/confused and attracted at the same time. 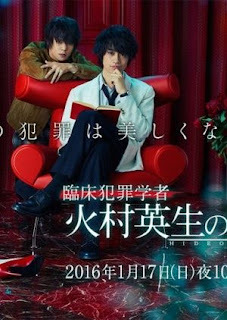 I am a fan of Kubota Masataka and this portrayal was point on~! All in all, a good drama with great acting, but just too much of the Sherlock Holmes ‘imitation’.